The Plants and Trees Stage of the Landscaping Phase allows you to place a wide variety of plants and trees to landscape your design. In this stage you will primarily use the Library to insert landscaping into your design. Fully Rendered in 3D: All plants and trees are fully rendered in 3D to create a visually stunning presentation of your landscaping design. Plant Variations: VizTerra uses a unique landscaping system to ensure every plant and tree looks natural and realistic. Each plant and tree in the library has 77,000 different possible variations. Every plant and tree you insert will be a different variation. You can change the variation of an inserted plant or tree by using the New Variation button located under Parameters. Animations: Nearly all the plants and trees in the library are animated. In the 3D view and in the Presentation mode, plants and trees will sway in the wind. You can turn off the animation for a selected plant or tree by using the Play/Pause button located under Parameters. In the Presentation mode you can stop all animations by pressing the Enter key or by pressing the Play/Pause button in the Presentation menu. You can default landscaping animations on or off for new plants and trees you insert with the Default New Landscaping Animations On checkbox located in the library options. Custom Landscaping Symbols: You may assign custom symbols to all the plants and trees in VizTerra. Choose from the over 2000 industry standard symbols included with the program or create your own. You may assign symbols to Plants and Trees in the library by using the Edit button. 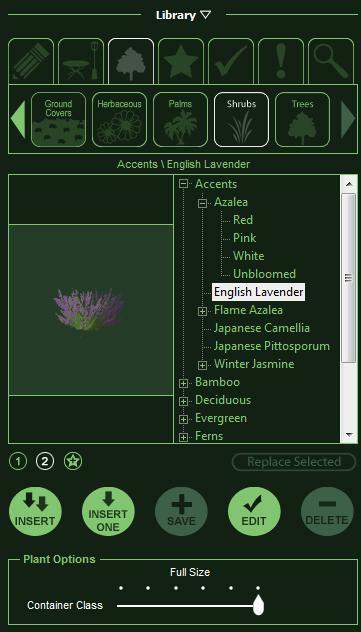 Botanical and Common Names: VizTerra can display plants and trees in the library under Botanical or Common names. You select which type of names you want to use in the Configuration menu. Landscaping Tab: All plants and trees in the library are locate under the Landscaping Tab. The Landscaping Tab contains a row of Category buttons. Left clicking on a Category button will bring up the names of the plants and trees organized by type. Plants and trees under the Landscaping Tab may be selected by left clicking on the plant or tree name. The plant or tree may be inserted by double left clicking on the name or using the Insert or Insert One buttons below. Favorites Button: The star button allows you to add the plant or tree currently selected in the library to your Favorites list. All Favorites are listed under the Favorites Tab. Any plant or tree in the library including plants and trees in the Currently Used and New Items lists as well as Search results can be added to Favorites. Pressing this button with a plant or tree selected in the Favorites list will remove the plant or tree from Favorites. Replace Selected: The button replaces the landscaping you currently have selected in the design with the plant or tree you have selected in the library. This command works well when combined with Select Matching found under Parameters. For example, combining both commands allows you to quickly exchange all the maple trees in your design for cedar trees. Container Class: This slider allows you to select the container class you would like to insert for the currently selected plant or tree in the library. The symbol for each container class can be set by using the Edit button. If you have Show Symbols in Library turned on, the symbol preview in the library will change as you select different container classes. Common Names and Botanical Names for Plants: Plants and trees may be displayed in the library with either common or botanical names. This setting may be changed by selecting Configuration from the View menu. In the Configuration window, select the System tab. Under Library, select the default for plant names. Random Rotate: Although you may select this option, it does not have any effect on plants and trees. Each plant and tree that you insert will be a different variation and already look unique, therefore it is not necessary to rotate landscaping. This option is used for other items in the library. Random Scale: Select this option when you want to insert multiple plants and trees. 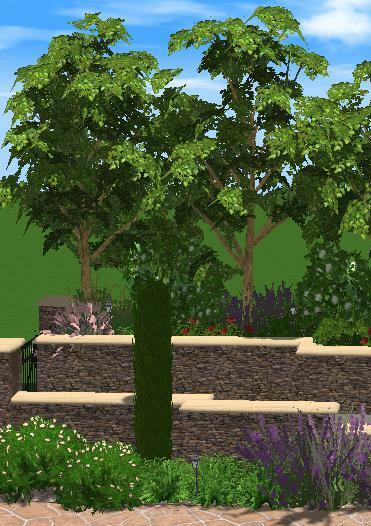 As you insert the selected landscaping, Pool Studio will automatically randomize the scale of each plant and tree you insert. Thus, each plant and tree that you insert will have a different appearance. Show Symbols in Library: Checking this box will set all plants and trees in the library to display as symbols. With this option turned on, the symbol preview in the library will change as you select different container classes. This makes it easy to place the proper container class symbol for the landscaping. Default New Landscaping to Symbols: Plants and trees may be shown in the 2D viewport either as 2D symbols or as 3D markers. Check this box to have new plants and trees insert as 2D symbols or uncheck the box to have new plants and trees insert as 3D markers. Plants and trees that have already been inserted can be changed under Parameters. Default New Animations On: This option does not have any effect on plants and trees. It is used for other items in the library. Default New Landscaping Animations On: Checking this box will default animations on for plants and trees inserted from the library. This controls the animations for plants and trees located under the Landscaping Tab in the library. Nearly all plants and trees in the library are animated. If you do not wish plants and trees to animate, uncheck this box to default animations to off. Animations for landscaping you have already inserted may be turned on/off by using the Play/Pause button located under Parameters. Search Tab: The Search Tab allows you to search for items in the Library by name. This allows you to find the plant or tree you are looking for by searching under its name. Searching for Plants and Trees: To search for a plant or tree, simply type the name of the plant or tree into the Search bar and press the Search button. The results of the search will appear below. Single words or groups of words may be entered into the Search bar. You may type in a specific plant name such as Apple Serviceberry or type in a category name such as Groundcovers. You may also type in the botanical or common name of the plant or tree regardless of what the library is currently set to display. The search feature will search plant names, categories, types, and subtypes. Search Options: The drop down box to the left of the Search bar allows you to choose from three different search options, All Words, Any Words, and Exact Phrase. All Words will return plants and trees that that match all of the words typed into the Search bar. Any Words will return plants and trees that match any of the words typed into the Search bar. Exact Phrase will only return plants and trees that exactly match the words typed into the search bar. Plants and Trees Found by the Search: Plants and Trees found by the search may be selected by left clicking on the name. The plant or tree may be inserted by double left clicking on the name or using the Insert or Insert One buttons below. Plants and Trees found by the search are listed alphabetically by name. The location of the Plant or Tree in the Library is displayed underneath the Tab row. The Tab, Category, Type, and Name of the plant or tree is listed. Moving in 3D: Plants and trees can be moved in 3D by using the 3D gizmo. The blue arrow will elevate the plant or tree up and down while the red green arrows will move it left to right and back and forth. You may move a single plant or trees, multiple landscaping, or groups of landscaping. Rotating in 3D: Plants and trees can be rotated in 3D by using the 3D gizmo. This allows you to not only rotate the landscaping but also tilt the plant or tree at an angle. You can tilt landscaping to properly place it on elevated terrain such as hills and tree mounds. The blue rotate arrow will rotate the plant or tree while the red and green arrows will tilt it. 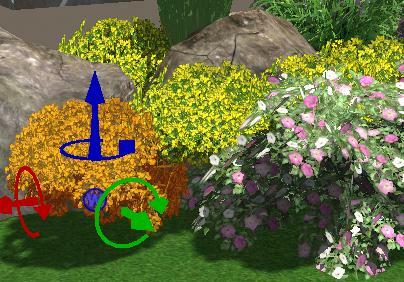 Landscaping will rotate according to the Snaps and Constraints you have set. 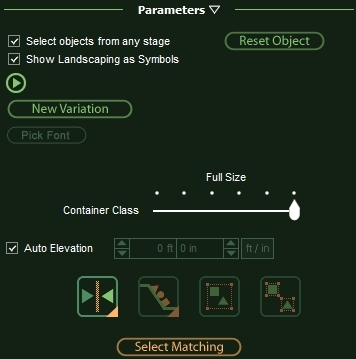 Show Landscaping as Symbols: This check box allows you to show a selected plant or tree as a 2D symbols instead of as a 3D marker in the 2D view. This allows you to change how a plant or tree you have already placed into your design appears. Uncheck the box to show the selected landscaping as a 3D marker again. Reset Object: This button allows you to reset a selected plant or tree that has been rotated. The plant or tree will reset to its default from the library. Play/Pause: This button allows you to turn animations on and off for a selected plant or tree. Pressing Play will turn on animations for a selected plant or tree while pressing Pause will stop animations. With animations on, the plant or tree will sway in a gentle breeze. New Variation: This button will change the variation of a selected plant or tree. This allows you to change the variation of a plant or tree you have already placed in your design. Container Class: This slider allows you to change the container class of a selected plant or tree. This allows you to change the container class of a plant or tree you have already placed in your design. Auto Elevation: With this box checked, a selected plant or tree will automatically snap to the surface underneath it. This means that plants and trees will be set to the elevation of the ground or if placed on a surface like a house piece, the height of the house piece. The plant or tree will even snap to a surface that has a negative height such as a sunken deck or planter. All library items by default are set to Auto Elevation when you insert them. Elevation Box: You can manually enter an elevation for a selected plant or tree here. Moving a plant or tree in 3D with the 3D gizmo will also set a manual elevation. You can assign landscaping symbols to the plants and trees in the library by using the Edit button. Edit Object: If a plant or tree under the Landscaping Tab is selected, pressing the Edit button will bring up the Edit Object box and allow you to change the symbol. 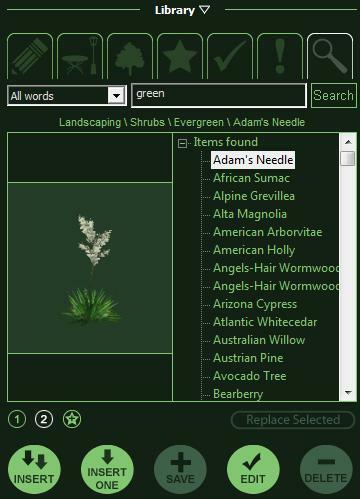 Assigning Custom Symbols to Plants and Trees: You can assign any of the over 2,000 landscaping symbols in the program or any custom landscaping symbols you have created to the plants and trees located under the Landscaping Tab. Select the plant or tree in the library and press the Edit button. 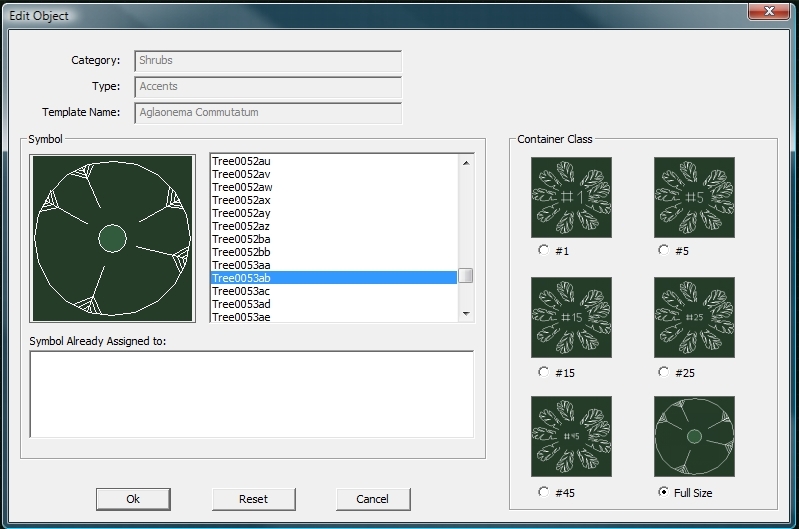 A list of all available symbols will appear alongside the six container classes for the plant in the Edit Object box. Click the radio button to select the Container Class you would like to change. Left click on the symbol name to select it. A preview image of the symbol will appear to the left of the list and the new symbol will appear above the Container Class. The Symbol Already Assigned To list will tell you what other plants currently use the symbol. Select each Container Class to make your changes. Press Ok the save your selections and change the symbols. You may reset the symbols to the VizTerra defaults by using the Reset button. Creating Your Own Symbols: You can create your own symbols in the Construction Stage. In the Construction Stage, draw the symbol in a block using the line and arc tools. Save the symbol to the Construction Template Library as a Selection in the Landscaping Symbols Category. Your custom symbol will now appear in the list in the Edit Object box. Please note, you must save your symbol to the Landscaping Symbols Category for it to appear in the list under Edit Objects. See the Construction Stage for more information. Resetting Symbols: You may set the symbol for any item back to the VizTerra default by pressing the Reset button in Edit Object. This will set all symbols and container class symbols for the item back to the program defaults.